Learn about John Shorb and Dana Morris-Jones. John Shorb is a Principal and co-founder of The Delphi Group, Inc. His extensive experience with both private and public sector organizations incorporates collaborative and participative processes to diagnose needs, build skills, and facilitate results-oriented strategic change. John’s clients include Fortune 50 international businesses, mid-sized manufacturing operations, public utilities, TV and newspaper media, federal government agencies, academic institutions and non-profit service providers. Specific projects have included: planning and implementing strategic and cultural change, building team-based organizational structures, helping Boards create strategic visions, building collaborative practices across internal and external boundaries, and coaching executives and managers in facilitative leadership skills. John’s effectiveness in working with teams and groups is grounded in many years as a line and staff manager in Procter & Gamble’s high performing systems, team-based operations. Clients note John’s strengths include his ability to work with a wide range of organizational levels and disciplines; his systemic view of how different parts of organizations are connected and their need for mutual alignment; and his ability to bring theory to practice through the application of performance management principles. John is a faculty member of The NTL Institute for Applied Behavioral Science, an internationally recognized organization in the field of behavioral science research and education, and for the American University/NTL Masters in Organization Development Masters program. 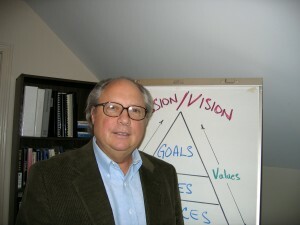 He is certified in the testing and application of Myers-Briggs Type Indicator. 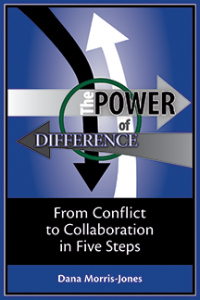 John has presented at national conferences of the Organization Development Network and the Ecology of Work and has published several articles on leadership, strategic change, and high-performing work teams. John earned an undergraduate degree in Electrical Engineering from The Johns Hopkins University, an MS in Operations Research from the U. of Pennsylvania, and pursued doctoral studies in Organizational Systems at The Fielding Institute. As a curious person with broad interests and experiences, John is also an accomplished musician, a published photographer, a licensed ‘ham’ radio operator, and an avid outdoors person who enjoys skiing, boating, fly fishing, hiking, biking and backpacking. Originally from Maryland, John has lived in various locations. The Delphi Group, Inc. is based in Maine and serves both US and international clients. Dana Morris-Jones, Principal and co-founder of The Delphi Group, Inc., has helped organizations, groups and individuals effectively fulfill their goals by applying the principles of human behavior to the business of success for more than twenty years. She has worked in private and public sector organizations as consultant, trainer and facilitator, assisting them to envision common goals, mobilize the talents and abilities of their workforce, inspire creativity and commitment, and navigate complex change. Dana’s clients have included public utilities, private manufacturing and service firms, state and federal government agencies and school systems. Clients value Dana’s ability to ‘keep us focused and goal-oriented and to help us reach our objectives’. She is described as a ‘talented and caring professional’ whose insights and presentation style ‘greatly energize and illuminate’ those with whom she works. As an internal consultant in a large gas & electric utility moving toward deregulation, Dana helped managers address the challenge of a dramatically changing environment. In that context, Dana worked to impact corporate culture through the creation of management development programs, processes for building strong teams, and methods for leading complex change. With Delphi Group partner John Shorb, Dana developed a 360° feedback process that is used as the basis for Executive Coaching and Leadership Development. Application of this diagnostic tool along with others such as The Myers-Briggs Type Indicator significantly enhances the effectiveness of the coaching and development process. Dana’s practice as a mediator has further strengthened her ability to facilitate communication and understanding and to build collaborative relationships among groups and individuals with disparate interests. Her expertise in the field of conflict resolution has led to the development of a proprietary model for resolving differences in organizations, which she has taught to Fortune 500 clients. In addition to serving clients, Dana has been a mentor and teacher to other professionals in the fields of Organization Development and Conflict Resolution. She has taught Masters level classes for the University of Maryland and for Johns Hopkins University and co-founded a Practicum program for consultants in conjunction with the Organization Development Network. She has published and presented papers on topics related to organizational change and behavior, consultant training, and conflict resolution in organizations. Dana earned a Ph.D. in Counseling Psychology, with a concentration in Organizational Development, from the University of Wisconsin – Madison. 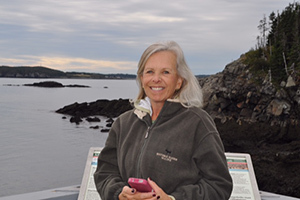 After many years as a solo practitioner, in 1998 she joined forces with John Shorb to create The Delphi Group, Inc. They now base their practice in Maine, where they also enjoy a multitude of outdoor recreational activities. Dana is also the parent of two adult children.